Full name is Salvador Johan Perez (Diaz)…resides in Weston, Fla. with wife, Maria Gabriela and sons, Salvador, Jr. and Johan...Played for the Venezuelan National Team in the 2013 and 2017 World Baseball Classic tournaments...Played for the Major League All-Stars in their Tour of Japan in November 2014...Participated in Royals FanFest, 2010-19…also participated in a calendar shoot for Braden's Hope for childhood cancer research, the annual Gloves for Kids fundraiser and events at the Guadalupe Center in Kansas City. Matched his career highs in homers (27) and RBI (80), both previously done in 2017, despite missing the first 20 games of the season with a sprained MCL...Named an American League All-Star for the sixth consecutive season and started at catcher for the fifth straight year, joining George Brett (1976-79, 1981-85) as the only Royals to start in five All-Star Games… became the first catcher to start at least five consecutive All-Star Games since Iván Rodríguez started nine straight from 1993-01, and is one of five players to be named an All-Star in each of the last six seasons (since 2013), joining: Paul Goldschmidt, Chris Sale, Max Scherzer and Mike Trout...Named American League Louisville Silver Slugger Award winner at catcher for the second time (also: 2016), joining George Brett (3) and Willie Wilson (2) as the only Royals to win the honor multiple times since it was established in 1980...Earned Rawlings Gold Glove honors for the fifth time (also: 2013-16), becoming one of seven catchers to win at least five Rawlings Gold Gloves, joining: Iván 'Pudge' Rodríguez (13), Johnny Bench (10), Yadier Molina (9), Bob Boone (7), Jim Sundberg (6) and Bill Freehan (5)...He's the sixth catcher to earn a Gold Glove and a Silver Slugger Award in the same season multiple times (also: 2016), joining: Iván Rodríguez (7), Joe Mauer (3), Lance Parrish (2), Benito Santiago (2) and Gary Carter (2)...Made 96 starts at catcher, his fewest since 2012 (74), but made a career-high 30 starts at designated hitter… started twice at first base (May 23 and July 23), his first starts there since Sept. 29, 2013...Became the seventh player since 1913 to play errorfree in at least 96 starts behind the plate, joining: James McCann (2015), Chris Snyder (2008), Chris Iannetta (2008), Mike Matheny (2003), Charles Johnson (1997) and Buddy Rosar (1946)...Threw out 24 runners attempting to steal in 51 chances (47.1%), tied for second most in the Majors behind Jonathan Lucroy (28), despite starting 23 fewer games at catcher...His stolen base percentage against (52.9%) was best in the Majors and best in Royals history, breaking Darrell Porter's single-season record of 56.1% in 1979…it was the best mark in the Majors since Joe Mauer (52.5%) and Yadier Molina (50.0%) in 2007...He had three catcher pickoffs-tied for third most in the Majors...Fell one HR shy of becoming the first in Major League history to increase his single-season HR total in seven consecutive seasons…he joined Jim Thome, David Ortiz and Darrin Fletcher as the only ones to do it in six straight...He's one of nine Royals to hit at least 25 HR in consecutive seasons…he's the first Major League catcher to do it since Iván Rodríguez (1999-2001) and Mike Piazza (1995-2002)...He's the ninth catcher all-time-six of which are in the Hall of Fame-with four 20-HR seasons (consecutive or not) before turning 29, joining: Johnny Bench (7), Brian McCann (6), Yogi Berra (5), Gary Carter (5), Mike Piazza (5), Lance Parrish (4), Iván Rodríguez (4) and Joe Torre (4)...Had nine homers and an American League-leading 28 RBI in his first 33 games (from April 24-May 27)...Hit his second career grand slam in the first inning at Baltimore on May 10, his 28th birthday, giving the Royals a 4-0 lead before an out was recorded…he's the 13th different Royal (16th time) to HR on his birthday and the second to hit a slam on his birthday, joining Mike Sweeney (2004)...Hit a go-ahead, two-run HR off Andrew Miller in the seventh inning on May 11 at Cleveland to complete a season-high five-run comeback (trailed 9-4, won 10-9)...Had three HR and eight RBI during a seven-game road trip to St. Louis and Texas from May 21-27, including a HR at three different positions: May 22 at St. Louis (catcher), May 23 at St. Louis (first baseman) and May 27 at Texas (designated hitter)...From July 11 through seasons' end, his 16 HR ranked tied for third in the American League-trailing only Khris Davis (27) and Joey Gallo (19)-despite hitting just one HR in his last 13 games...Named Royals Player of the Month for July, after leading the team in HR (7), RBI (21) and slugging percentage (.565)…homered in consecutive games from July 28-29, capping a four-game set at Yankee Stadium in which he hit .438 (7-for-16) with three HR and six RBI…it was his second Royals Player of the Month Award and first since September 2013...Recorded his fifth career multi-HR game on Aug. 15 vs. Toronto, his 20th and 21st HR of the season, becoming the fifth Royal with at least four straight 20- HR season, joining: John Mayberry (1972-75), Steve Balboni (1984-87), Bo Jackson (1987-90 and Mike Sweeney (1999-2002)...Matched a career high with five RBI on Sept. 14 vs. Minnesota, including the sixth walk-off grand slam in the Royals' 50-year history…it was his second career walk-off HR and first since Sept. 15, 2012 vs. the Angels...His 27th HR of the season on Sept. 22 in Detroit was also his 500th career RBI, making him one of 13 Royals to reach the 500-RBI milestone. Played in 129 games, including 115 behind the plate, his fewest since 2012 (76 games)…missed 16 days (Aug. 6-21) due to an intercostal strain, his first stint on the disabled list since 2013…also didn't start KC's final three contests due to injury ... Despite an injury-plagued second half, set career highs in homers (27), RBI (80) and slugging percentage (.495)… also matched career-bests in runs scored (57) and go-ahead RBI (17) ... Selected to the American League All-Star team for the fifth consecutive year, making his fourth-straight start…he's the second Royals player to start at least four-straight All-Star Games, joining George Brett who did it twice (1976-79 and 1981-85)…went 0-for-2 in the game in Miami ... Participated in the World Baseball Classic for the second time, playing in two games before suffering a knee injury and missing the rest of the tournament…went 2-for-7 with a double, a home run and two RBI ... Slugged 24 of his 27 home runs as a catcher, breaking his own franchise record of 21 (2015 and 2016)…his total ranked third in the Majors, behind only Gary Sanchez (27) and Mike Zunino (25)…over the past three seasons, his 66 home runs as a catcher are tops in baseball ... Also ranked third in the Majors with 74 RBI as a catcher, behind Yadier Molina (82) and Sanchez (80) ... Recorded a .598 slugging percentage on the road, ranking fourth in the American League…hit 21 of his 27 homers away from Kauffman Stadium, which was also fourth in the Junior Circuit ... Ranked eighth in the AL, slugging .599 during day games, which also tied for third in Royals history…had a .289/.318/.599 slash line in afternoon contests (41-for-142), compared to .258/.288/.450 at night (85-for-329) ... Batted .353/.385/.640 (49-for-139) with 11 doubles, one triple, nine homers and 26 RBI in the seventh inning or later…among AL hitters with at least 125 at-bats after the sixth, his slugging percentage led the league, while his batting average ranked second to Jose Altuve (.361) ... Hit .359/.390/.641 (14-for-39) with two doubles, three homers and seven RBI in 10 Interleague games ... Connected for 12 of his 27 homers against AL Central foes, including five each vs. Detroit and Minnesota and two vs. Chicago ... Best month was June, when he hit .345/.360/.631 (29- for-84) with nine doubles, five homers and 18 RBI…that included a season-best 10-game hitting streak from June 5-18, in which he hit .439 (18-for-41) ... Homered in four-straight games (April 6-9), becoming the first Royal to do that since Billy Butler in 2011…came up one shy of matching the franchise record of five-straight games with a home run (Mike Sweeney, 2002) ... Matched a franchise record with three home runs during the May 21 doubleheader at Target Field…Bill Pecota is the only other Royal to have a three-homer doubleheader, doing so July 14, 1989 at Yankee Stadium...hit a pair of roundtrippers in the nightcap of the twinbill, his first of two multi-homer games in 2017, also going deep twice on Sept. 6 at Comerica Park ... Hit his 100th career home run on June 10 at San Diego, becoming the fifth-youngest Royal to reach 100 dingers (27 years, 31 days), behind Carlos Beltran (26-107), Billy Butler (26-149), John Mayberry (26-178) and Eric Hosmer (26-323) ... Clubbed his first career grand slam on June 21 vs. Boston, turning a 4-2 deficit into a 6-4 lead in the eighth…according to Elias Sports Bureau, it was the second slam by a Royals player in the eighth inning or later that turned a deficit into a lead, with Frank White hitting the first on May 15, 1986 vs. the White Sox ... Matched a career high with two doubles in a game, twice - April 30 vs. Minnesota and Sept. 23 at Guaranteed Rate Field ... Recorded his third career stolen base on July 20 vs. Detroit, his first since April 8, 2015 against the White Sox ... Threw out 15 would-be basestealers in 69 attempts (21.7 percent), his lowest total since 2012 (15 in 40 attempts). Played in 139 games, making 128 starts behind the plate…also served as the designated hitter on seven occasions…his 139 games were his fewest since 2013, missing six games due to a quad contusion suffered May 28 after colliding with Cheslor Cuthbert chasing a foul popup...Selected to his fourth consecutive All-Star Game, earning the starting nod for the third straight year, becoming the first Royal to do that since George Brett (1981-85)…hit the go-ahead two-run homer in the second inning off former teammate Johnny Cueto...Received a Major League best 4,965,838 All-Star Game votes, becoming the first Royal to lead the Majors in All-Star voting since George Brett in 1981...Won his fourth-straight Rawlings Gold Glove Award, becoming the first Royal to win four or more in a row since Frank White (1977-82) won six-straight…his streak is the longest by an AL catcher since Hall of Famer Ivan Rodriguez won 10 in a row (1992-2001)...Named the AL's Silver Slugger Award honoree at catcher…became the first Royals backstop to earn the award...Set a career high with 22 home runs, including 21 as a catcher to match his franchise record from 2015… became the second Royals catcher (Darrell Porter) to hit 15 home runs or more in three different seasons (also, 2014)...Matched career highs in runs scored (57), doubles (28) and walks (22), all previously done in 2014...Hit .305 (67-for-220) with 14 doubles, two triples, 12 homers and 35 RBI over his first 60 games…batted just .204 (60-for-294) with 24 extra-base hits and 29 RBI in his final 79 games...Led American League catchers in hits for the fourthstraight season…also tops in doubles, homers, extrabase hits and slugging percentage (.436) among AL catchers...Threw out 30 would-be basestealers, second most in the Majors behind Jonathan Lucroy (40)…his 48.1 caught stealing percentage ranked first in the Majors in 2016 (min. 25 attempts) and set a new franchise record (min. 40 attempts)...Batted .291 (71-for-244) with 19 doubles, two triples, 11 homers and 37 RBI vs. AL Central foes…his .520 slugging percentage within the division ranked sixth in the Majors (min. 150 at-bats)...Established a career high with five RBI on April 19 vs. Detroit, collecting a two-run double and a three-run homer…became the first Royals catcher with five RBI in a game since John Buck did it on April 30, 2009 vs. Toronto...Went 5-for-5 with three runs scored on May 23 at Minnesota, finishing a homer shy of the cycle…became the second Royals catcher to have five hits in a game, joining Darrell Porter, who did it against the White Sox on June 4, 1978…it was the first five-hit game by a Royal since Billy Butler on Sept. 5, 2013...Had a season-best 12-game hitting streak from May 13-27, batting .417 (20-for-48) with three doubles, a triple, two homers and seven RBI…it matched the second-longest streak of his career, trailing only his 17-game run in 2012...Had his second career walk-off RBI in the regular season on July 7 vs. Seattle, a two-run double in the ninth inning off Steve Cishek...Recorded his second career multi-homer game on Aug. 27 at Boston with a pair of solo shots…became the first visiting catcher to hit two homers in a game at Fenway Park since Russell Martin did it on April 9, 2011. Salvador was selected to the All-Star Game for the third time in his career, starting behind the plate for the American League for the second-straight season…he became the first Royal to start consecutive years at the Midsummer Classic since George Brett did it in five-straight years (1981-85)...Earned his third-straight Rawlings Gold Glove, becoming the first A.L. catcher to win three straight since Joe Mauer (2008-10)...Set a franchise record with 21 home runs as a catcher, passing Mike Macfarlane, who hit 20 as a backstop in 1993… eight of his 21 home runs came in the seventh inning or later...Blasted a go-ahead solo shot off Texas reliever Keone Kela in the eighth inning of a 4-3 victory on June 7...Hit a game-tying two-run homer in the ninth inning at Detroit on September 18, sending the game into extra-innings...Led A.L. catchers in hits (137) and doubles (25) and ranked third in homers (21) and RBI (70)...Recorded 38 two-out RBI, which ranked ninth in the American League…hit .371 (26-for-70) with runners in scoring position and two outs, which was third in the A.L. among hitters with at least 50 at-bats in those situations...Hit .311 with a .489 slugging percentage with runners in scoring position...Batted .293 (22-for-75) with five doubles and two homers in 19 Interleague games...Hit .326 (28-for-86) with five doubles, three homers and 14 RBI during the month of April…batted .296 (32-for- 108) with six doubles, three homers and 15 RBI over his final 30 regular season games...Matched a career high with two doubles at Baltimore on September 13, marking the seventh time he's done that...Had three hits in a game six times and had four games with three RBI...Tied for third in the A.L., throwing out 24 would-be basestealers…since the start of the 2013 season, Salvy has gunned down 70 runners trying to steal, which ranks second in the Major Leagues, behind only Russell Martin (82)...Unanimously named World Series MVP, becoming the seventh catcher to win MVP honors in the Fall Classic and first since Toronto's Pat Borders in 1992...also the second Venezuelan-born player to earn the honor, joining Pablo Sandoval, who did it with San Francisco in 2012...Started all 16 postseason games behind the plate…hit four postseason homers, which tied for fifth among all participants...his 10 runs scored also tied for fifth...His four homers were tied for second most by a catcher in a single postseason, while he was the first backstop to hit as many as four home runs since Boston's Jason Varitek did it during the 2003 playoffs...Hit .364 (8-for-22) with two doubles and two RBI during the World Series…collected three hits in Game #4 of the series, his second three-hit contest in the Fall Classic...In 12 career World Series games, he's hit .348 (16-for-46) with three doubles, a homer and six RBI…hit safely in 10 of 12 contests during the Fall Classic. Salvador had another All-Star campaign with a strong first half of the season...started a Royals record 143 games behind the plate, while his 146 regular season games as a catcher overall were also tops in team history...Selected to his second All-Star Game, becoming the first Royals player to start in the Midsummer Classic since Jermaine Dye did in 2000...Sal grounded out in his only at-bat...Led A.L. catchers in hits (150) and multi-hit games (40), while he was second in extra-base hits (47) and tied for second in runs scored (57)...His 150 hits were the most by a Royals backstop since Darrell Porter's 155 base knocks during the 1979 season...His 17 homers tied for eighth-most by a KC catcher with Mike Macfarlane's 1992 total...Perez got off to a great start, hitting .283 with 18 doubles, 11 homers and 36 RBI before the All-Star break, but posted a .229 average with 11 doubles, two triples, six homers and 34 RBI after the break...Enjoyed his best month in June, where he batted .347 (35-for-101) with four doubles, five homers and 16 RBI...Had a season-best 12-game hitting streak, June 5-18, where he hit .370 (17-for-46)...Despite hitting just .229 in August, he tied for 10th in the American League with 20 RBI...Batted .320 (24-for-75) with four doubles, five homers and 14 RBI in Interleague contests...This included multi-hit contests in five of his first six against the Senior Circuit...Went 4-for-4 on Opening Day (March 31) in Detroit, becoming the first Royal to collect four hits on Opening Day since Fred Patek did it against Toronto in 1979...Blasted a game-winning three-run homer in the ninth inning at Tampa Bay off Kirby Yates, giving the Royals a 5-4 come-from-behind victory...Threw out 23 would-be base stealers, which ranked fifth in the American League...Over the past two seasons, he's nabbed 46 runners trying to steal, which are tops in the American League and rank third in the Majors, behind only Russell Martin (57) and Wellington Castillo (47)...Tied for the Major League lead with four pickoffs from behind the plate, while his total led the Junior Circuit...Salvy's 13 career pickoffs are the most by a Royals catcher and rank sixth among active catchers with Chris Iannetta...Caught every inning during the Royals' postseason run, starting all 15 games...Combining the regular season and playoffs, his 161 games caught were the most in Major League history...Hit .333 (8-for-24) with a double, a home run and four RBI during the World Series...Homered off World Series MVP Madison Bumgarner in Game 1, the only run the lefty allowed during the Fall Classic...Also had a two-run double in Game 2 of the Series...Collected the third walk-off hit in Royals postseason history with the game-winning RBI single in the 9-8 Wild Card win over the A's. Salvador had a breakout year, becoming the first Royals' catcher selected to the All-Star Game since 1980 (DarrellPorter) and the first KC backstop to earn a Rawlings Gold Glove award since 1989 (Bob Boone)... Became the first Royals player to collect a hit in the Midsummer Classic since Bo Jackson in 1989...caught the final All-Star inning (eighth) thrown by legendary closer, Mariano Rivera, the game's MVP... Finished the season with a bang, hitting .367 (44-for-120) with eight homers and 32 RBI after August 23...tied with Detroit's Victor Martinez for highest average and most hits in that span...his 32 RBI over the final 36 gameswere second-most in MLB to San Francisco's Hunter Pence (35)... Ranked second in the American League with a .377 average (46-for-122) with runners in scoring position...alsoninth in the league, batting .317 vs. left-handed pitching... Collected 140 hits as a catcher, the most in Royals history...total led the A.L., and was second in the Majors to St. Louis' Yadier Molina (158)... Batted .310 (77-for-248) vs. A.L. Central opponents, which ranked second to Detroit's Victor Martinez (.331) forhighest within the division (min. 200 AB)...hit .318 (74-for-233) with six homers and 44 RBI at "The K"... Led A.L. catchers, throwing out 23 would-be base stealers...threw out 35.2 percent of baserunners trying to steal,which was the second-highest percentage in the league among backstops with at least 100 games... KC's pitchers had a 3.36 ERA when he was behind the plate, the best mark in the A.L. and fifth in the Majors...recorded his ninth career pickoff on April 20 at Boston, which extended his club record... Hit safely in 11-straight games, June 5-15, matching the second-longest streak in his career... Recorded first career multi-homer game at Minnesota, August 28, becoming the first KC catcher to homer twice in a game since Miguel Olivo in 2009...also matched career bests with four hits and four RBI in the same game... Collected four RBI vs. Tampa Bay on August 26 with a three-run homer and a sac fly... Broke a tie with a pinch-hit bases-clearing double vs. Cleveland, July 4, in a 10-7 win... Missed nine games after being placed on the Bereavement List (May 25) and seven games after being placed on the Concussion D.L. (August 3). Salvy came off the 60-day D.L. on June 22 with an 11-game hitting streak in which he hit .425 (17-for-40) with 3 doubles and 3 home runs...he had missed the entire 2012 season to that point after undergoing surgery in March to repair a torn meniscus in his left knee...Led all MLB catchers with 5 pickoffs in just 74 games, 2 more than anyone else...the 5 pickoffs were a franchise single-season record and his 8 career pickoffs also are a Royals career record...Posted a career-best and 2012 team-high 17-game hitting streak from August 22-September 13...hit .361 (26-for-72) during this streak which was the longest ever by a Royals catcher...also hit in 16 straight as a catcher (1 as DH), the longest streak by a MLB backstop in 2012...After returning from the D.L. on June 22, led all A.L. catchers (min. 70 games caught over that span) in average (.301), hits (87), runs (38), and doubles (16)...His 27 strikeouts were tied for the second-fewest in MLB among players with at least 250 at bats...fewest was Philly's Placido Polanco with 25...Opponents attempted just 40 stolen bases in his 74 games and he caught 15 of the 40 (37.5%), the best pct. among all A.L. catchers (min. 70 games)...Hit his first pro walk-off homer on September 15 vs. Los Angeles...Following season, played for La Guaira in the Venezuelan Winter League...serving as the DH for a majority of his 32 games, he hit .371 with 10 doubles, 8 home runs and 39 RBI and was named Venezuelan Winter League Rookie of the Year...Signed a five-year contract through 2016 with three options seasons: 2017, 2018 and 2019, on February 27, 2012...Following regular season, was named Venezuelan Winter League Rookie of the Year after batting .371 (49-for-132) with 10 doubles, eight home runs, 39 RBI and 23 runs in 32 games for La Guaira. Began his successful climb to gain the Royals starting catcher spot with Double-A NW Arkansas before being promoted to Omaha (AAA) and then to the Majors for his first time in August. ... Had his contract selected on August 10 and made his debut that night at Tampa Bay ... recorded his first big league hit with a single and also picked off runners at both first and third base. ... Blasted his first career home run off the Tigers'Max Scherzer on August 29 at Detroit. ... After hitting just .182 (6-for-33) in his first 9 games as a big leaguer, batted .374 (43-for-115) in his final 30 games ... his .374 mark from August 21 on was the fourth-highest in baseball. Spent the entire season at Wilmington (A Advanced) as one of the youngest players in the Carolina League...opened the year at 19 before turning 20 on May 10...After batting .260 with a .298 on-base pct. and .387 slugging prior to the All-Star break, hit .318 with a .343on-base pct. and .432 slugging following the break, including .402 with 4 home runs and 18 RBI in 24 gamesin August and September...Finished eighth in the Carolina League in batting average...Caught 37 of 88 attempted basestealers for a 42% clip...Capped the campaign by participating for Surprise in the Arizona Fall League. April 24, 2018 Kansas City Royals activated C Salvador Perez from the 10-day injured list. April 19, 2018 Kansas City Royals sent C Salvador Perez on a rehab assignment to Omaha Storm Chasers. April 15, 2018 Kansas City Royals sent C Salvador Perez on a rehab assignment to Northwest Arkansas Naturals. March 29, 2018 Kansas City Royals placed C Salvador Perez on the 10-day disabled list retroactive to March 26, 2018. Left knee sprain. August 22, 2017 Kansas City Royals activated C Salvador Perez from the 10-day disabled list. August 6, 2017 Kansas City Royals placed C Salvador Perez on the 10-day disabled list retroactive to August 5, 2017. Right intercostal strain. 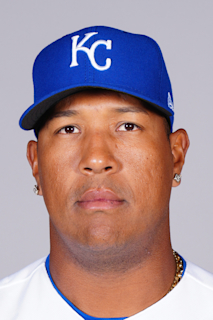 December 4, 2014 C Salvador Perez assigned to Tiburones de La Guaira. August 11, 2013 Kansas City Royals activated C Salvador Perez from the 7-day disabled list. August 4, 2013 Kansas City Royals placed C Salvador Perez on the 7-day disabled list. Mild concussion. June 4, 2013 Kansas City Royals activated C Salvador Perez from the restricted list. June 2, 2013 Kansas City Royals placed C Salvador Perez on the restricted list. May 26, 2013 Kansas City Royals placed C Salvador Perez on the bereavement list. November 13, 2012 C Salvador Perez assigned to Tiburones de La Guaira. June 22, 2012 Kansas City Royals activated C Salvador Perez from the 60-day disabled list. June 7, 2012 sent C Salvador Perez on a rehab assignment to Omaha Storm Chasers. March 20, 2012 Kansas City Royals placed C Salvador Perez on the 60-day disabled list. Recovering from March 2012 left knee surgery. August 10, 2011 Kansas City Royals selected the contract of C Salvador Perez from Omaha Storm Chasers. July 27, 2011 Salvador Perez assigned to Omaha Storm Chasers from Northwest Arkansas Naturals. March 30, 2011 Salvador Perez assigned to Northwest Arkansas Naturals from Wilmington Blue Rocks. January 3, 2011 Kansas City Royals invited non-roster C Salvador Perez to spring training. August 31, 2010 Salvador Perez assigned to Surprise Rafters. April 6, 2010 Salvador Perez assigned to Wilmington Blue Rocks from Idaho Falls Chukars. June 20, 2009 Salvador Perez assigned to Idaho Falls Chukars from Burlington Bees.